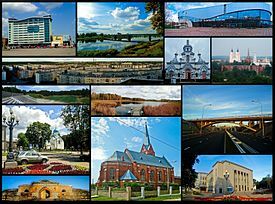 Daugavpils (Latvian pronunciation: [ˈdaʊɡaʊpils] ( listen); Latgalian: Daugpiļs [ˈdaʊkʲpʲilʲsʲ]; Russian: Даугавпилс [ˈdaʊɡəfpʲɪls]) is a city in southeastern Latvia. It is on the banks of the Daugava River, from which the city gets its name. Daugavpils literally means "Daugava Castle". It is the second largest city in the country after the capital Riga. This page was last changed on 11 June 2018, at 16:48.